43 Years After Surviving Israeli Attack on USS Liberty, US Veteran Joe Meadors Seized by Israeli Forces on Gaza Aid Flotilla | Democracy Now! 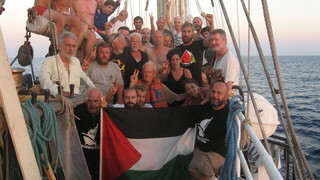 was aboard one of the Free Gaza boats trying to go to Gaza that Israel seized. He is also a survivor of the 1967 attack by Israel on the US military ship USS Liberty that killed thirty-four Americans. AMY GOODMAN: We’re also joined by Joe Meadors, who was on one of the other Free Gaza boats that was seized early Monday morning. For Meadors, this marks the second time he’s been aboard a ship attacked by the Israeli forces in international waters. We’re going to go back now to 1967. Meadors was a signalman aboard the USS Liberty, a US Navy electronic-intelligence-gathering ship that was attacked by Israeli planes and torpedo boats in 1967. Thirty-four Americans were killed, more than 170 wounded, in the attack. At the time, the Liberty was cruising international waters off the Egyptian coast in the midst of what became known as the Israeli-Arab Six Day War. Joe Meadors joins us now from Texas. Welcome to Democracy Now! Go back to 1967. Explain what happened. Joe, if you could repeat what you were just saying? Well, we’re going to try right now to go to a clip, to go to an excerpt of White House — about this attack that occurred in 1967. It’s from a documentary called Loss of Liberty. STAN WHITE: I was coming to go back to the TRESSCOM area. I stepped out on deck. A plane came by. I looked right in the cockpit. He waved, I waved. That’s how close they were. And they knew who we were. GEORGE GOLDEN: Of all the recon flights that they had that morning, over looking at our ship for approximately six to seven hours, they had a good idea of what they were doing. And they hit — they hit us hard and fast with everything they had. NARRATOR: Commander William McGonagle, the ship’s captain, although he had been badly wounded, most of his bridge crew had been killed, he stayed on the bridge throughout the attack and the long night that followed. Admired and respected by his crew, he received the Congressional Medal of Honor for gallantry. CAPT. WILLIAM McGONAGLE: When the planes struck, it was without provocation and certainly unexpected, and they seemed to descend on us from all directions at the same time. Those rockets and machine guns tore the ship. It killed men on deck. And we were defenseless. AMY GOODMAN: That’s an excerpt of the documentary Loss of Liberty, as we turn to another excerpt. CAPT. WILLIAM McGONAGLE: It appeared, from the ferocity of the attack, that the intent of the attackers was to sink the ship. Maybe they hoped to have no survivors, so that they would not be held accountable for the attack after it occurred. STAN WHITE: We didn’t know who was attacking us. They didn’t know who was attacking us. I don’t know how Washington can say, “Don’t go, because they’re friends of ours.” So that’s the thing that’s always bothered me right there. DEAN RUSK: I never, myself, accepted the Israeli purported explanation. Accidents don’t occur through repeated attacks by service vessels and by aircraft. It obviously was a decision taken pretty high up on the Israeli side, because it involved combined forces. The ship was flying an American flag. Even if it had been unidentified from an Israeli point of view, it was a reckless thing for them to do. Suppose it had been a Soviet ship. That could have produced very large problems indeed. AMY GOODMAN: That, an excerpt again of the documentary about the 1967 USS Liberty. Joe Meadors is on the line with us, a survivor of that attack by the Israeli military on the US military ship that killed thirty-four Americans. Most Americans are not familiar, Joe, with this story. Explain where you were on the boat in 1967. Then we’ll talk about what happened this past weekend. JOE MEADORS: I was one of the two signalmen on the ship, and as a signalman, my work station was on the very top deck. It’s virtually an open deck. But at the beginning of the attack, I was up there, and most of the time I was up — either up there or down in the pilot house, one deck below. JOE MEADORS: Throughout the whole morning, we had been flown over about a dozen times by Israeli aircraft, who were clearly identifying us. We had overheard their pilots radioing back to their bases. Two o’clock in the afternoon, two more — two Israeli air jets blew up our starboard side. And we were in the pilot house, so we ran up to the signal bridge, anticipating just another circling of the ship. The aircraft got directly ahead of us and turned immediately left and started strafing the ship. They had rockets inside each of the four gun sheds. We had four .50-caliber machine guns. And they also put rockets directly into each of the antenna mounts. AMY GOODMAN: Why were they attacking a US military ship? JOE MEADORS: They claim that they were — they mistook us for a forty-year-old rusted-out Egyptian tramp steamer, the El-Kasir. I don’t think anybody believes that. AMY GOODMAN: We were looking — just watching and listening to people like Dean Rusk, the US Secretary of State. It’s now, what, more than forty years later. What were you doing on the Gaza aid flotilla? JOE MEADORS: I had been invited by the people at the Free Palestine Movement to visit the Gaza and see if we can try to break the blockade. AMY GOODMAN: In the case of 1967, did Israel ever claim responsibility for the attack? And what was the response of your government, of the United States? JOE MEADORS: They claimed that they mistook us for an Egyptian tramp steamer. They claimed it was a mistake, and they apologized for the mistake. The US government accepted it. But then again, the US government has never conducted an investigation of the attack. War crimes were committed by both Israel and the United States during that attack, and we’ve been trying to get them investigated, but the US government just ignores our request. 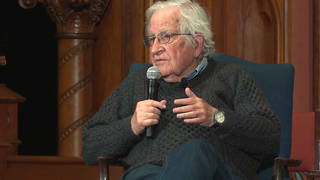 AMY GOODMAN: Which ship were you on this time, Joe, forty years later? JOE MEADORS: I was on the Greek passenger ship, the Svendoni. AMY GOODMAN: And your thoughts about what happened last weekend in the early morning hours of Monday? JOE MEADORS: I was kind of apprehensive, given the history I’ve had with the Israelis. I seem to have all the bad luck in the world when it comes to the Israelis. Their overtaking of our ship was quite simple. They just jumped onboard, a couple dozen of them, and took over the ship. They used tasers and kicked some of the people topside when they were trying to protect the captain and the pilot house. But their actions were quite swift. AMY GOODMAN: And anything happen to you? JOE MEADORS: No, nothing happened to me. As a matter of fact, on hindsight, they were fairly polite. It was always “please” and “thank you,” but those words take on a different meaning when they’re said at the point of a gun. AMY GOODMAN: You were not, though, on the Mavi Marmara, where the nine activists were killed. JOE MEADORS: No, we weren’t there. AMY GOODMAN: Well, Joe Meadors, I want to thank you very much for being with us, survivor of the 1967 USS Liberty attack, where thirty-four Americans were killed, more than a hundred injured.